Although the term “landscaping” often brings to mind images of grass, gardens and greenery, natural stone steps are just as widely used for the purposes of bringing the perfect touch to a front or back yard. 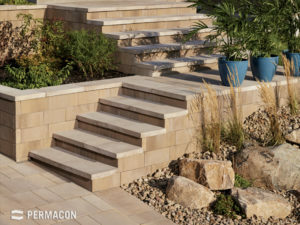 Whether they’re used for patio, porch, or a unique structure smack in the middle of your outdoor paradise, natural steps have a rugged beauty that makes them a great tool for Mississauga homeowners and contractors alike. A short list won’t give you nearly enough to know about your options, however – stone steps can be created from a vast selection of different types of stone, and your final choice will vary depending on your ideas for depth, texture and the specific look you want for your yard. At Lane’s Landscaping, we’ll work with you – whether you’re a Mississauga homeowner or contractor – to help find the right type of natural stone steps for your project. Whether you’re adding to the porch, patio, back deck or want to do something completely different, we’ll work with you to understand the scope of your project and the specific aspects you’re looking to add to your yard so we can effectively meet your needs for a perfect outdoor paradise. To learn more about our selection of natural stone steps and how they can add a new level of beauty to your yard, browse our selection or contact us today.